Faithful elasticated braided Tow Rope is fitted with heavy-duty forged carabiner style end hooks and supplied with a red middle marker. Elastic towing ropes work by taking up the slack when the cars are slowing down and by easing in the towing load when pulling away. 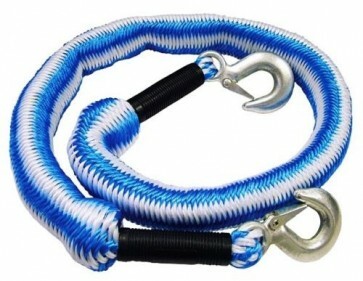 The rope is rot resistant and has a breaking strain of 3000kg (3 Tonnes). Suitable for all cars and vans up to 3000kg (3 Tonnes). Supplied complete in a zip up bag for easy car boot or garage storage. Specifications: Breaking strain: 3000kg (3 Tonnes).